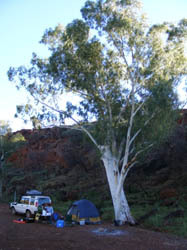 Trip notes taken from the magazine/handbook "Explore the Pilbara in your 4WD". This is Trip No. 3 in that publication. This was our second outing after making camp at Newman, WA. The trip notes in the above magazine are excellent and we didn\'t put a foot wrong. An eerie landscape that looks like it suffered a nuclear blast sometime in the past with only a few trees pushing through the hard crust. We love our 4WDriving so relished the weird landscape but the pool was a little dissapointing as there was no water flowing and the pool looked a bit too still for us to want to jump in. A nice and very isolated spot to camp. I\'d love to go back when the water is flowing but in that case, would need to take care on the approach to this site as there is a wide creek crossing that will be flowing too. On the way back out, we took the detour to \'Three Pools\', another oasis amongst a rocky outcrop. Very tempting to jump in but would require quite a climb out. Water looked deep & clear. My partner Zed & I found this a relaxing spot and stayed longer than we should have and were a little late getting back to Newman. Only passed one other car over the whole 2 days we were out. We took a movie of the weird landscape & I\'ll place a link here once I\'ve loaded it up to YouTube.